Use the WeatherFlow WEATHERmeter and your smartphone to capture accurate location-specific weather conditions and report the data instantly to farm managers. Make sure weather conditions comply with regulations before spraying. 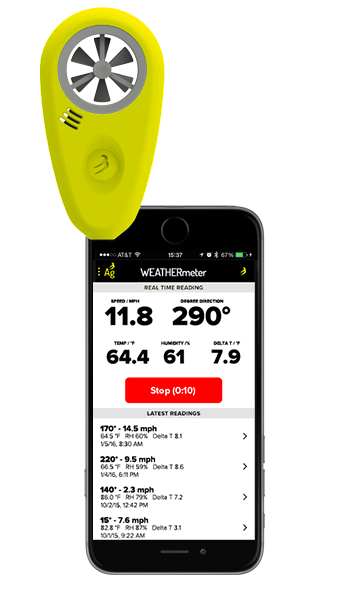 WEATHERmeter for Agriculture uses Bluetooth Smart technology (also known as Bluetooth LE) to connect to all Apple iPhones 4S or newer & iPads Generation 3 or newer operating on iOS 6.0 or newer. They also work with Bluetooth Smart Ready Android phones & tablets with operating system 4.3 (Jelly Bean) or newer.